‘Would you like me to give you a formula for success? It’s quite simple, really! Double your rate of failure… You’re thinking of failure as the enemy of success. But it isn’t at all… You can be discouraged by failure–or you can learn from it. So go ahead and make mistakes. Make all you can. Because, remember that’s where you’ll find success. On the far side’. -Thomas John Watson, Sr.
How can we turn what is seemingly a failure as a stepping stone to success? Here is a very illustrative story–In the early 70s, there was a man named Fred Smith who wrote a term paper as an undergraduate, wherein he presented a novel idea, a parallel system to manage the logistic system in a complex emerging business scenario. He thought it was a brilliant idea, however his idea was not appreciated much and he landed a C grade for his project. Undeterred and with great faith & conviction in his idea, Fred activated that very project into a business model and worked hard despite challenges and huge stumbling blocks to find the world’s largest express transportation company, the FedEx Corp, which today stands worth $41 billion in revenues. Winston Churchill once said that success is going from failure to failure without losing one’s enthusiasm. We never really fail until we give up trying, trying with determination and with enthusiasm. Actually, challenges or failures can be stepping stones or stumbling blocks on the road to success. It is all a matter of how we look at it. You can see a glass is half empty or you could see the glass is half full. One would bring you enthusiasm, one would get you discouraged. We can apply that principle to every aspect of our lives. What is of real importance is that we ensure we are on a learning continuum all the time. How do we learn mostly in our lives? We learn from our mistakes, isnt it? 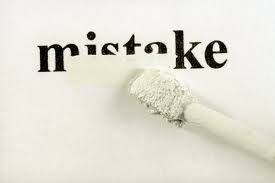 Mistake remains a mistake only if we fail to learn from it! Real leaders make many, many mistakes, but they do not repeat them, they learn from them, they remain enthusiastic, they remain determined to achieve their goal. Actual champions are those who in every situation are focussed on their goal, they make goals, and losers make excuses. Our life is what we make of it! When we learn from our mistakes or our failure, we become stronger, we develop greater integrity. In the vedic texts, there is description of three types of persons in performing their duties : the first one is called a ‘kanishta’, a person who does not begin any endeavor, fearful that he may fail; the second person is one who endeavors, but turns back when obstacles and failures comes on his path & he is called a ‘madyam’; and the third one is the ‘uttam’, the first class man who keeps his mind fixed on the goal, and does not turn back till he achieves it. So, next time you are in the face of a big stumbling block or think you are heading towards failure, take heed, just know that in that failure is the seed of success and put on the garb of the ‘uttam’ i,e mind fixed on the goal. In today’s fiercely competitive scenario, there is also a tendency to rate our success in relative terms that of others. These kinds of comparative thought processes are not only burdensome and pull you down but also have the potency to drive you away from your desired goal. The Bhagavad Gita 18th chapter describes how you can achieving your goals in the most positive manner. It says people who perform work that causes violence and pain to others are working in mode of ignorance. Such people perform their work disregarding spiritual injunctions & this kind of work will have negative bearing on the performer in the long term. Second set of people work in the mode of passion. They endeavor very hard for selfish reasons and for reasons of self-enjoyment, don’t give up easily. However, they have to bear the consequences of such work. The Bhagavad Gita recommends the third set of people who work in the mode of goodness. Such people endeavor without being discouraged or over elated by either success or failure because they are free from dualities. They work for the good of people in general and when such people succeed in fulfilling their mission, they have the most positive bearing for themselves and for others. Such people represent true builders of the society. Ultimately, according to the Gita, the real success of life is if we can remember God at the time of death. Death is the final exam. We may succeed in so many of the temporal endeavors of this world but we should be very careful to make sure that our human life is a success and not a failure. If we not God conscious at the time of death our human life has failed. Radhanath Swami gives the formula for success–’Have your spiritual goals and orchestrate all your duties and your material obligations in harmony with that spiritual goal and you will be successful’. Thank you for sharing this success formula which is God centered and therefore prone to be more successful. It is said the success of life is ante Narayana smrti – to remember Narayana at the end of one’s life. If we practice everyday, we can be prepared for the final exam. Cultivating a spiritual process to all paths of life will ensure our success in our final exam. Thanks for sharing. wonderful article…especially the first few sentences of Thomas John Watson, Sr are revolutionary. An interesting and an informative article, with many references to spiritual and educational sources. Radhanath Swami gives the formula for success–’Have your spiritual goals and orchestrate all your duties and your material obligations in harmony with that spiritual goal and you will be successful’.- noted! Thankyou Radhanath swami for instructing us thru such wonderful devotees!! Nice article. Very wonderful profound teachings are told here. Thank you very much. Very inspiring article on perceiving apparent failure as only stepping stones for success. Very inspiring story of Mr Fred Smith, founder of Fed- Ex corporation. Thank you inspiring Radhanath Swami Maharaj. Material obligations should in harmony with spiritual goal of remembering Krishna at the time of death. Thats success ! Champions make goals and losers make excuses – this is very interesting and makes one more aware of their attitude towards mistakes. An enlightening article, giving some insight into how to make the most of the mistakes we make without feeling disheartened. It is very important to define what success is. And Radhanath Swami has very clearly defined it as harmomizing our duties with our spiritual goals. yes, the final exam-death is more important than the exams in life. wonderful article. Its the final cause and the end goal which determines whether the work is in mode of passion or goodness. Working passionately for a higher selfless cause is in the mode of goodness. And working zealously for the spreading spiritual awareness is much better and beyond the three modes..
As HH Radhanath Swami says, its very important to align our material duties in line with our spiritual goals and work towards that. Great article. Boxers practice boxing by voluntarily facing resistance. Athelete runs by overcoming resistance of friction. By making mistakes or overcoming struggles or resistance one becomes stronger. Spiritual goal is very important in a life of human being. He should work each act aiming this spiritual goal. His life is successful. All glories to HH Radhanatha Swami Maharaja. never say die…never give up…have faith in Krishna. This article really changes attitude of looking at turn up events. Failures are not zombies. And ultimately, we must orchestrate our duties and material obligations in harmony with spiritual goal. Thanks for sharing this very vital aspect of learning from the mistakes and failures to make this human form of life into an instrument to be submitted to the Love for the Lord. They are in truth the happy, content and successful people-They work for the good of people in general and when such people succeed in fulfilling their mission, they have the most positive bearing for themselves and for others. Such people represent true builders of the society. to err is human …………. ‘Have your spiritual goals and orchestrate all your duties and your material obligations in harmony with that spiritual goal and you will be successful’-such a powerful success formula indeed!! Thank you very much for sharing this God centered formula. If one is grateful, he is happy to do his part and not affected if the outcome is success or failure. He sees it as the gift of God and as the author rightly says, he can learn from it and keep moving on. Thank you for showing us that we have to cultivate our spiritual goals to be successful in our lives. Thank you for reminding us that real success is being able to remember the Lord at the time of the death. Wonderful article. Very nicely started to grab everyone’s attention and touching very nice points and concluded with by explaining what is real success and real final goal of a human. Thank you very much. Thank you for this insightful article. As Srila Prabhupada says the word impossible is in fool’s dictionary. When one has the proper knowledge and faith in the words of the Lord or His bonafide representative, there is no need to give up! Yes, i had heard a lecture in person on “Failures as stepping stones to success” by Radhanath Swami few years back. Its true, we do not lose until we stop trying. but we also need to understand if our work is in mode of goodness or not and if we are keeping God in center of our activities. Beautiful presentation. Its so true that despite of all our endeovors in our material life we are still not happy and that is a common sense that something is missing..and unless we put One ahead of whatever Zeros we have life is meaningless. We have to put our life centern towards Supreme lord and that is only way we can feel the real happiness. Nicely explained article.It will help reader to adjust between the situations of succsess and failure.Also according to instruction of acharyas that life is a praperation and death is a examination.So need not worry about failures in life. Thank you for presenting wonderfully that success does not really mean not having any failures but always keeping enthusiasm. It was a very apt definition of success. This article came as an eye opener for many of us as we take success as an enemy of failure. Learning from mistakes is so crucial to go ahead and get better in our lives. Thank you for explaining the topic through wonderful illustrations ranging from from common man’s life to sacred text like Bhagavat Gita.